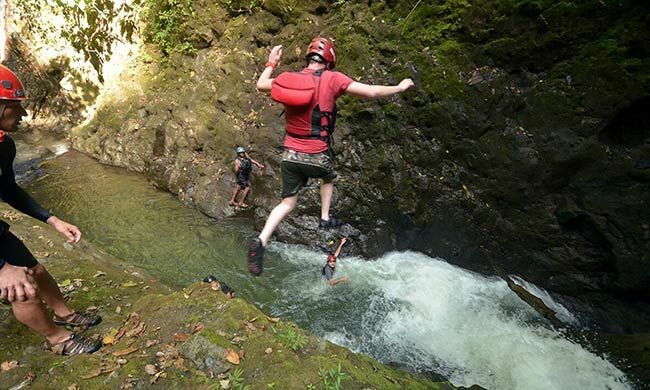 Get Extreme in Arenal's Rivers and Canyons! This heart-pumping experience of jumping down waterfalls in Costa Rica´s jungle is not for the faint of heart. Leaping off the sides of canyons and plunging into flowing waterfalls and deep pools is for adventure seekers only! After a pleasant 45-minute drive through the countryside and into the jungle, those up for the challenge will receive a thorough safety briefing and get suited up. Only then will the waterfall rappelling and jumping from canyons begin! Your first thrill of the day will be rappelling down an 80-foot waterfall—no small feat! Take a plunge into the clear pool of water below and swim to shore. Then, make your way along a path through the jungle for a few minutes until you get to you next destination. Here your professional, safety-conscious guides will direct you as you jump a series of five 10- to 30-foot waterfalls! Afterwards you will stop at a place where you can change into dry clothes and have lunch. The Gravity Falls Waterfall Jumping Tour is an extreme tour recommended for adventure-seeking families with adolescents and groups of friends. Adrenaline junkies will have a hard time beating this experience! Age limit: 15-60 years old. Good physical condition but no experience required. Not for those that are afraid of heights. Your tour includes: Transportation to and from your hotel, all equipment, guide, lunch, drinks. What to bring: clothes to get wet in, a change of clothes, sturdy water shoes/sneakers, insect repellent. And you won´t want to forget your GoPro. Pics or it didn’t happen! Note: This tour is also available as a ten-hour combo tour, with an additional mountain biking tour and then white water rafting on the Balsa River.